HCM City (VNA) – The annual summer camp for youth expats and those living in Ho Chi Minh City is open from July 19-22 under the theme “I Love Vietnam”. 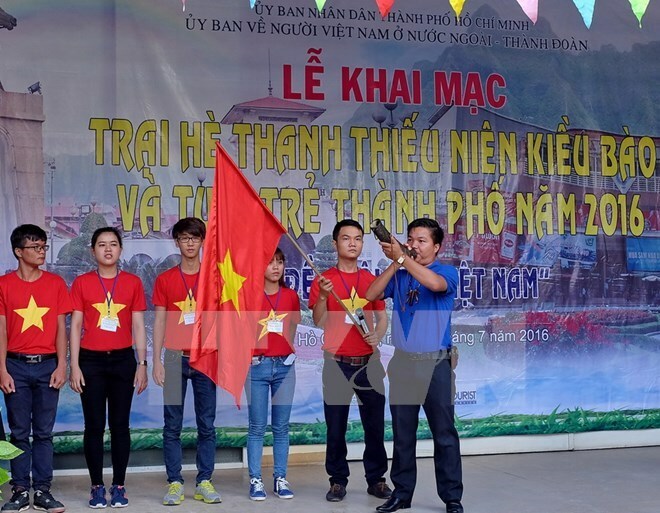 The camp was organised by the city’s Committee for Overseas Vietnamese Affairs and Ho Chi Minh Communist Youth Union to bring the youth living abroad closer to their home country with a host of activities held in Ho Chi Minh City and Da Lat city in the Central Highland province of Lam Dong. The four-day event attracted about 60 Vietnamese teenagers and young adults living in Cambodia, Laos, Thailand, the US, Russia, the Czech Republic, Ukraine and so on, alongside those from Ho Chi Minh City. They will visit a number of beauty spots in the country and discover local unique cultures. They will be offered a chance to experience daily life on a farm on the outskirts of Ho Chi Minh City and learn about the work of embroidery artists, the craft and tradition of Gong Culture, and how to grow and harvest strawberries in Da Lat city.